Tea has always been a powerful symbol of protest in the United States, even before it was a nation. But there's more to that story than meets the eye. Alpha Trivette's measured voice leads listeners on a journey through the history of "tea parties" in the United States. 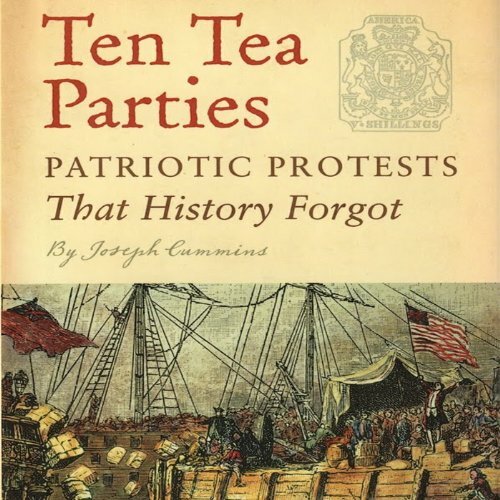 Joseph Cummins' Ten Tea Parties: Patriotic Protests that History Forgot includes short chapters packed with anecdotes dealing with subjects ranging from the historical context of tea during the colonial period to the burning of a brigantine full of tea in Annapolis, Maryland. This accessible audiobook will be a favorite with those who want to be inspired by the solidarity and courage of Americans. Everyone knows the story of the Boston Tea Party - in which colonists stormed three British ships and dumped 92,000 pounds of tea into Boston Harbor. But do you know the history of the Philadelphia Tea Party (December 1773)? How about the York, Maine, Tea Party (September 1774) or the Wilmington, North Carolina, Tea Party (March 1775)? Ten Tea Parties is the first book to chronicle all these uniquely American protests. Author and historian Joseph Cummins begins with the history of the East India Company (the biggest global corporation in the eighteenth century) and their staggering financial losses during the Boston Tea Party (more than a million dollars in today’s money). From there we travel to Philadelphia, where Captain Samuel Ayres was nearly tarred and feathered by a mob of 8,000 angry patriots. Then we set sail for New York City, where the Sons of Liberty raided the London and heaved 18 chests of tea into the Hudson River. Still later, in Annapolis, Maryland, a brigantine carrying 2,320 pounds of the “wretched weed” was burned to ashes. Together, the stories in Ten Tea Parties illuminate the power of Americans banding together as Americans - for the very first time in the fledgling nation’s history. It’s no wonder these patriots remain an inspiration to so many people today. ©2012 Joseph Cummins (P)2013 Audible, Inc.